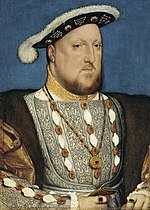 I Henry VII of England no rainy. Ny vadiny dia Catherine of Aragon, Anne Boleyn, Jane Seymour, Anne of Cleves, Catherine Howard, Catherine Parr. Ny zanany dia Mary I an'i Angletera, Henry FitzRoy, 1st Duke of Richmond and Somerset, Elizabeth I an'i Angletera, Edward VI of England, Henry, Duke of Cornwall, Margaret Tudor. Voaova farany tamin'ny 8 Jiona 2016 amin'ny 12:08 ity pejy ity.